“How did you get into this?” This is a question that we are asked quite frequently. Well we didn't come up with the idea, but we did see a need in the hydrographics market and made it into a reality! The idea came to us when Bryan (the owner) was searching the web and saw a hydro-dipped part for his car in carbon fiber. After being blown away with the hydrographics process, he started quickly wondered how he could bring this to his hometown. 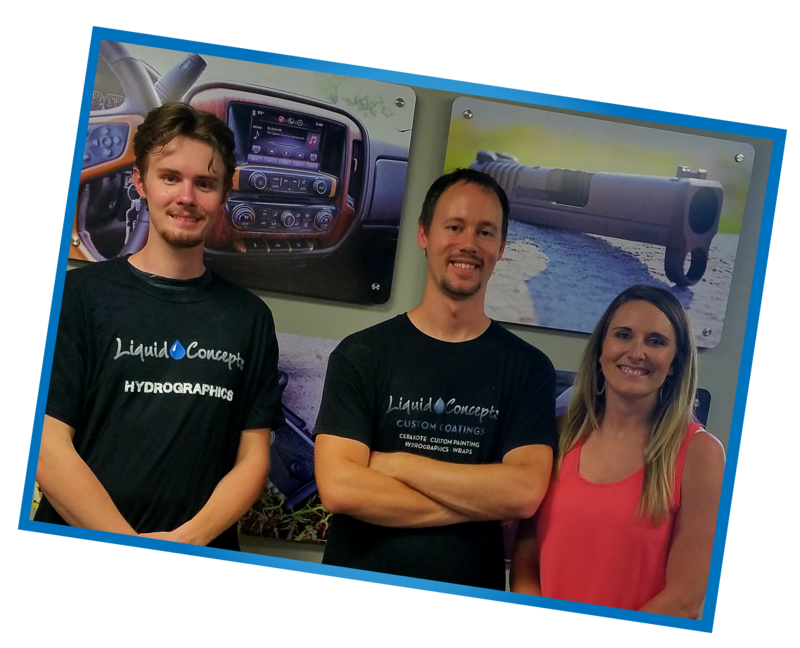 With Bryan’s background in the automotive painting industry he thought hydrographics would be the next step in the evolution of an ever changing custom coatings industry. As with many small business’ this started as a hobby, in a single car garage pouring countless hours into learning the hydro-dipping process, determined to figure it out with little resources for training at our disposal. We shortly realized that there was a need for more than just the hydrographics service. There was a need for a full service water transfer printing distribution center that could help train those wanting to get into the hydro-dipping industry as well as provide high quality equipment and products with the absolute best customer service. Fast forward more than 10 years later and we have trained 500+ individuals around the entire world in the art of hydrographics and offer a one-stop-shop for all of your hydrographic needs! Expanding into a larger state of the art facility has allowed us the opportunity to provide custom coatings services to everyone. Servicing OEM production runs as well as one off custom pieces, while still continuing our water transfer printing distribution services. Along with Hydro-dipping we have also branched out over the years now servicing customers with high quality custom automotive painting, vehicle wraps, vinyl graphics, high temp coatings and are even Cerakote Certified. We have taken our once-then hobby to a whole new level! Along the way we have made sure to never lose sight of how we got here and why we started this to begin with. We then and still now want to offer all of our customers with outstanding hydro-dipping products, the best customer service and some of the most unique custom finishes out there!